Melt frosting in a saucepan over low heat (so to not burn it) until frosting is glossy Add chips and continue cooking over low heat stirring until chips are melted and blended well with frosting. Pour contents out into a greased 8" x 8" pan (or parchment paper lined pan). 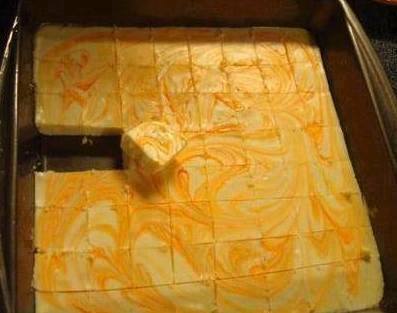 Drizzle Orange Crush Ice Cream topping over top and if desired, swirl topping through fudge with a fork or toothpick. Cool in refrigerator until set.